Our quest of the best Italian dishes in Chicago, according to Italians, continues. And this time we are going to talk about a hot (and yummy) topic: PIZZA! If you read our previous post (and if you didn’t you can read it here), you should already have on your “restaurants bucket list” the top Italian restaurants in Chicago. You are probably thinking that you have all the necessary information to mindfully decide where to take your date or your friends for an authentic Italian meal. In the mind of ‘born and raised’ Italians, restaurants and pizzerias are two different things and therefore they cannot be judged in the same way. Aware of this distinction we dug again in the Italian community, seeking to identify the best pizzerias in Chicago. According to Italians, when judging the quality of a pizza there are two very important factors to consider: the dough and the quality of the toppings. No matter if you order a Margherita or a Capricciosa, the dough has to be soft but not too chewy and the toppings have to invade your mouth with flavor. All the pizzerias listed follow the criteria. No pizzeria paid us to be promoted. It’s our own mission to deliver you the most relevant and authentic information about the ‘made in Italy’ and everything that revolves around our beloved country. The Italians living in Chicago voted and here are the top pizza destinations in town. Buon appetito! Inaugurated in 2017, Bonci is the latest arrival in the Pizza landscape of Chicago. Bonci's way of making and selling pizza - the Roman style - is different from all the others. Also called “Al Taglio”, this type of pizza is rectangular, loaded with toppings, cut with scissors into quadrilateral slices and sold by weight. This feature makes it the perfect choice for a quick, yet flavor loaded meal to enjoy with friends or on-the-go. 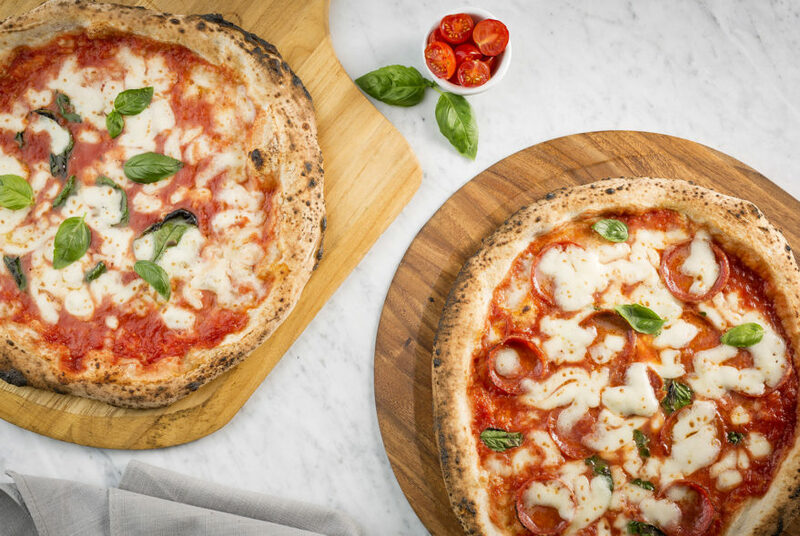 Recently relocated in the Hyde Park area, Nella delivers a 360 degree Neapolitan experience. Named after the owner, Nella Grassano, the pizzeria genuinely expresses the most important Italian values: tradition and family. These values are reflected in the quality of their pizzas. Each pizza is prepared following the family pizza making tradition and topped only with the best ingredients coming straight from Napoli. Rossopomodoro is a worldwide know brand for authentic Neapolitan pizza. Founded in Naples, Rossopomodoro exports the traditional way of making pizza all over the world, with multiple locations in Europe, United States, South America, Middle East and Asia. Eataly Chicago team up with Rossopomodoro to deliver one of the best and most authentic Pizza in Chicago. You can find the restaurant at the second floor of the Eataly store. Spacca Napoli is a Pizza landmark in Chicago. The owner Jon, a certified pizzaiuolo (pizza maker in Italian), has been serving authentic Italian pizza for over a decade, carefully sourcing each ingredient from trusted vendors. Besides the classics, like Margerita or Marinara, Spacca Napoli offers a vast array of interesting combinations of high quality toppings. With two locations, one located on Harlem Avenue and the second conveniently located in the trendy West Loop area, Forno Rosso is the favorite pizzeria of Italians living in Chicago. The pizzeria is part of the (VPN) Verace Pizza Napoletana, an international non-for profit organization seeking to cultivate the culinary art of making Pizza Napoletana. The sparkling vibe of the restaurant and the high quality of their pizzas easily position them as the place to be for an authentic Italian Pizza experience.